I’ve mentioned before that I love reading long stories and novellas… and I still love how the genre gives just enough room for a writer to develop characters and a complex story but not enough space for aimless wandering. That in mind, here are two more novellas: their stories are very, very different but I think both are successful in their own ways. I’ll try to go light on details because I think short stories, long stories, and novellas are especially prone to spoilage. I think it’s a safe bet that Anna Starobinets’s Переходный возраст (An Awkward Age, translated by Hugh Aplin), a long story about Max, a maladjusted boy with a twin sister, Vika, and some bizarre habits, will be most effective among readers with insect phobias. I was the kid who adored her multi-module Ant Farm, but An Awkward Age contained some ew-inducing moments for me, too, thanks to several squalid discoveries and Max’s mother’s rather impassive reactions to her son’s behavior. Starobinets tells her story in simple language where repeated motifs help build suspense, and I thought she did nicely combining nature and city by setting the story amongst the trees and birds of Moscow’s Yasnevo outskirts. Another plus: she explains the reasons behind Max’s behavior by having his mother discover his diaries, handily reproduced in the story. I found some of that section particularly entertaining thanks to young Max’s phonetic spelling. Though I didn’t think An Awkward Age was nearly as good or fun as Starobinets’s Sanctuary 3/9, a later work that’s loaded with fear and fairy tale themes, I have to give her credit for stringing me along pretty well with An Awkward Age. I read it very quickly and not just because of the large print in my book. Starobinets is often compared to Stephen King, something the Mainer in me can’t quite buy into, though I have to wonder if Starobinets’s inclusion of a prom-like senior dance is intended to remind readers of King’s Carrie. Irina Bogatyreva’s Товарищ Анна (Comrade Anna), a finalist for this year’s Belkin Prize and nominee for the NatsBest, is a slower-paced, far more rewarding (and difficult to write about!) long story, about the relationship—it’s more than just young love because of how the story’s written—between Anna, a Muscovite who takes retro to extremes with her political activity, and Valka, an easy-going guy from Ulyanovsk who falls for Anna. I think what I appreciate most about Comrade Anna is Bogatyreva’s ability to contrast the lives of Anna and Valka: Anna, for example, lives with a politically liberal grandmother who disagrees with her granddaughter’s views and seems to be verging on dementia, and Valka lives on the eleventh floor of a dorm with a roommate, the roommate’s girlfriend, and a cat. Plus a model of the solar system for perspective. What’s most intriguing is that Valka’s atmosphere is freer and more “collective” than Anna’s; Anna is a member of a cell-like political organization that aims to recreate the allegedly good old days of revolution. Members even dress in costume for new year’s eve. By contrast, Valka’s dormmates (re)tell his story in the first person singular, observing Valka’s behavior and sliding in and out of a close third-person narrative. Still, they speak in a unified voice that’s far more cohesive and human than what we get from Anna’s group, where members disagree on how and how much to act. Their language is tragicomically stagnant, too, because it’s filled with Soviet-era phrases. Though I never quite grasped why Valka fell so hard for Anna—from a distance, in the Metro—that he felt compelled to follow her and introduce himself, I realized that didn’t matter much. For one thing, Bogatyreva filters Valka’s story through his dormmates, who can’t know everything. For another, the attraction fits with the novella’s appealingly appropriate combination of reality and irreality. Another example: Bogatyreva includes a tangent at the start of Comrade Anna that presents a dormmate obsessed with Mikhail Vrubel’s “Swan Princess” painting. He dies and Valka takes his place on the eleventh floor. Bogatyreva returns to the Swan Princess at the end of the story in a way that puzzled me a bit until I read Marta Antonicheva’s review in the journal Октябрь: to paraphrase, Antonicheva thinks the Swan Princess helps establish Valka’s transition back to real life after the costumes and falsity of Anna’s circle. Which makes complete sense to me, given the fairy tales they want to believe in. Disclosures: I’ve met and chatted with Irina Bogatyreva a couple of times; she was kind enough to give me the text of Comrade Anna. Up Next: I swear I will finish the translation list soon! Plus two more novellas/short novels: Viktor Pelevin’s Omon Ra and Igor Sakhnovskii’s Насущные нужды умерших (The Vital Needs of the Dead). 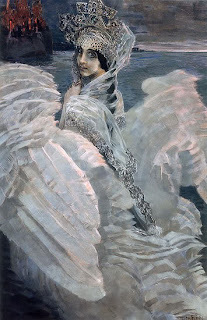 Image credit: Mikhail Vrubel’s Swan Princess painting, via Wikipedia. The Information begins when a nameless first-person narrator, a Muscovite from the Volga region who works in media buying (медиабаинг, some information-based field I don’t truly grasp in either language), sees his wife received a text message from another man, wishing her a good night and calling her рыбка (how about “my little fish”?). After intercepting this information, our anti-hero storms out, gets drunk, and ends up with frostbite that nearly results in amputation. Marriage over. I can typify much of the rest of the novel with a long, messy list: Nameless Guy gets a new apartment, sees old friends that include a driver named Ivan and a writer named Svechin who also form a rock group called Bad Omen (echoing Senchin’s own experience), attempts a relationship with the temptingly named Angelina, goes to Dagestan for a work assignment, and nearly marries a woman with all sorts of emotional problems. Senchin is, fortunately, still Senchin so nasty complications arise to make Nameless Guy’s life even more of a living hell. Samples: legal and financial problems related to apartments, a bender that causes hallucinations, and a traffic cop planting white powder in Nameless Guy’s Celica. What I like about Senchin so very much is that I can’t say he’s unfair. Nameless Guy is one of the most unsympathetic and obnoxious narrators I’ve had the (dis)pleasure to read in a long time. Nameless Guy drinks himself way beyond stupid more than once, admits to cheating on his wife (prostitutes are okay? ), and describes his feelings for women in ways that make you suspect he’s incapable of respect. He’s typing up his story—his “information” about events—in a darkened apartment because he’s hiding out. He thinks several people want to kill him. I could cite many books that feel like The Information’s thematic and formal ancestors—from Lermontov’s Hero of Our Time and Dostoevsky’s Notes from the Underground to Sergei Minaev’s lighter Soulless and Oleg Pavlov’s heavier Asystole—plus Nameless Guy compares his imaginary self to the title character of American Psycho and mentions enjoying works like Sartre’s Nausea and Céline’s Journey to the End of the Night. I read (and also loved) Nausea years ago and found that the Wikipedia page description for Journey could almost describe The Information, too, thanks to its nihilism, misanthropy, and cynical humor. Existentialism is crucial here: with his behavior and his hiding, Nameless Guy essentially crosses himself out of a meaningful existence, both in the lives of his friends and family, and in the larger world. Not that his life has had much meaning during the years he describes; this superfluous man for the noughties has had ideas to do good things, like establish a literary journal, but that’s forgotten early in the book because all his drama, much of it self-inflicted, interrupts plans to build a normal (normal! ), comfortable life as a middle-class office worker. What amazes me most about The Information is that it works beautifully, as a diabolical combination of realism, satire, parody, and the grotesque. Nameless Guy tells his story in colloquial language that is almost painfully unpretty at times. And the story itself is horribly lumpy, chronologically confusing, and angry. The Information’s narrator is so appealingly unappealing that I couldn’t put the book down—I’m one of those rubbernecker readers who loves to observe jerks involved in psychic accidents—though I was initially disappointed in the book’s structure and TMI, thinking Senchin had let me down with The Information after the social and formal precision and concision of his Yeltyshevs, which looks at some similar themes using very different settings, characters, and style. But then Nameless Guy began criticizing his own writing and explaining his minutiae. And then I focused on the quotation on the back of the book and began reading The Information as a twisted confessional novel about life in the age of reality programming, where everyone knows absolutely everything about everyone else’s business (right, my little fishes? ), the global financial crisis wreaks havoc on jobs, and a generation of young adults is still trying to figure itself out after the collapse of the Soviet Union. The most devastating aspect of The Information was reading the last page and closing the book, wondering if anybody in Nameless Guy’s life would even care if he ceased to exist. I also wondered if the threats were real: did any of those threateners really care enough to want to end Nameless Guy’s existence? It’s unclear, particularly given that this century’s superfluous men learn of death threats through virtual seconds who use computers and smart phones instead of personal visits. Disclaimer. I have translated some of Roman Senchin’s work, including excerpts from his Yeltyshevs. Up Next: List of new and upcoming translations. And Irina Bogatyreva’s Товарищ Анна (Comrade Anna). And a very special thank you… to my friend S. and her family, who brought me The Information (plus books by Ganieva and Shulpyakov that I’ve already written about) from Moscow this winter. There’s more award news this week: for one thing, Oleg Pavlov won the Solzhenitsyn Prize, an annual prize that carries an award of $25,000. I’ll take the easy way out and quote the message I received from Pavlov’s literary agency, Elkost, which says the prize recognizes “works in which troubles of the Russian life are shown with rare moral purity and sense of tragedy, for consecutiveness and steadiness in search of truth.” That’s not too far from the jury’s quote that’s included in a news item on lenta.ru. Previous Solzhenitsyn Prize winners include Valentin Rasputin, Aleksei Varlamov, and Viktor Astaf’ev. I’ve written about two of Pavlov’s novels: Казенная сказка (A Barracks Tale) and Асистолия (Asystole or Flatline). Meanwhile, the Russian Prize (Русская премия) announced their longlist last week. The long fiction longlist includes Yuz Aleshkovskii’s Маленький тюремный роман (A Little Prison Novel), which I bought a few weeks ago, and Elena Katishonovk’s Когда уходит человек (When a Person Leaves). Maria Rybakova’s Gnedich (a novel in verse) and Sasha Sokolov’s Триптих (Triptych) are among the short fiction entries. The full longlists for poetry, short prose, and long prose are all on the Russian Prize Website. The Russian Prize is awarded to writers who live outside Russia and write in Russian. 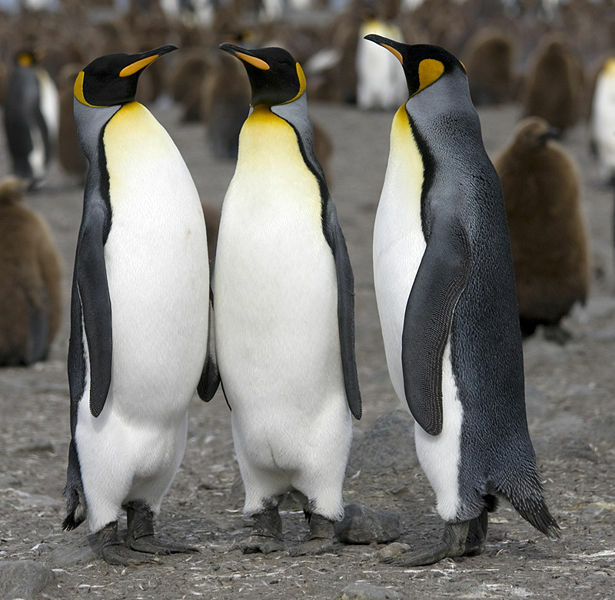 Misha is a king penguin. Finally, (in more ways than one!) I read Andrei Kurkov’s Death and the Penguin, in George Bird’s translation… I’d included the novel on my list of books for a program at my town library last week and realized too late that I could get the original through interlibrary loan. The book seems to have more than one Russian title; the most common being Пикник на льду, literally Picnic on the Ice. Picnics on the ice are a pastime of Viktor, a writer in Kiev who composes obituaries of people still among the living: Viktor and his pet penguin, Misha, go with a mutual friend to the Dnepr, where Misha swims under the ice while the humans enjoy snacks. I was glad not to know much about the book before reading so will just say that Kurkov’s plot includes Viktor finding himself caring for a small girl and needing to keep a low profile because of post-Soviet dangers linked to those obituaries. Of course Viktor also frequently buys frozen fish. I thought the book was enjoyable, fairly light reading with an apt blend of absurdity and social commentary. And who can resist a sad, affectionate penguin, a precocious little girl, and their lonely caregiver? I almost want to say that Melancholic Absurdity is the novel’s main character. Blogger Marie Cloutier, also known as Boston Bibliophile, recently heard Kurkov speak at a bookstore event and said he discussed similarities between penguins and Soviets. To quote Marie, “both, he said, are used to rigid civil structures and don’t know how to operate outside of their group.” I thought Aleksei Balakin’s review of Picnic on the Ice, in a 2006 issue of the journal Критическая масса (Critical Mass) offered a nice analysis of the paradox of Kurkov’s work, which is popular in Europe but relatively unknown in Russia. Melville House, which published Death and the Penguin in the U.S. last year, has released two other Kurkov books in Bird’s translations: Penguin Lost (2011) and The Case of the General’s Thumb (2012). Additional Kurkov books are available in English translation from U.K. publishers. Up Next: That darn list of recent and upcoming translations. And Roman Senchin’s Информация (The Information). We’ll see which I finish first. Image Credit: King penguin photo by Samuel Blanc, via Wikipedia.